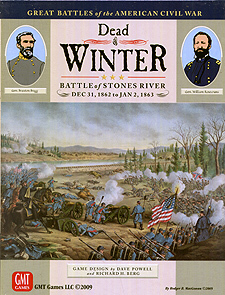 Dead of Winter is Volume V in the Great Battles of the American Civil War series and depicts the battle of Murfreesboro; also known as the Battle of Stone's River to Union Veterans. It is December, 1862. Far to the west two major armies are set to grapple for control of Middle Tennessee. Perhaps one of the most evenly matched battles of the war, Murfreesboro/Stone's River pits the Federal Army of the Cumberland under Major General William Starke Rosecrans against the Confederate Army of Tennessee captained by General Braxton Bragg. This is the first major battle both men would fight as army commanders. Both armies number about 40,000 men, and each general plans to strike the enemy's right flank. Bragg strikes first, launching an early morning assault against the unsuspecting Union forces. The Army of the Cumberland learns the same harsh lesson about preparedness that the Army of the Tennessee learned earlier at Shiloh. Though initially surprised and hard pressed, the Union army does not break. Rosecrans rises to the occasion and does an admirable job of directing, inspiring and rallying his troops against fierce Confederate assaults. By the end of the day, at heavy cost to both sides, the Union army has been pushed back, but not defeated. Later, the battle ends with one last forlorn Confederate charge against the Union left. With both armies too exhausted to continue the fight, the Confederate Army of Tennessee retreats, leaving the field to the Union forces. This series is one of the hobby's longest lived design concepts, springing from the legendary regimental level Gettysburg game Terrible Swift Sword (SPI) designed by Richard Berg in 1976. Since then, the series has undergone numerous system evolutions, always seeking to enhance the player's illusion of reality. Today, the series relies on inter-active chit-pull mechanics to simulate the sometimes chaotic nature of the 19th Century battlefield. Dead of Winter contains one Introductory and 10 regular scenarios that examine every aspect of the historical battle and present players with several plausible alternative situations based on events leading up to the actual engagement. Scenario sizes range from one-half of one map and one hour to play, to all four maps and many enjoyable gaming hours to play. Also included are a number of optional forces that could have been brought into the fight. Keep your opponent guessing as to what he will face next time with this interesting range of game options.